Phillip Kotokwa was born in 1972 in Harare, Zimbabwe and received his education in Mabvuku. From an early age, he had shown a great interest in stone sculpting and attended art school. After leaving school, he worked at Duly’s Holding- a car company- while dreaming about his love of sculpting. In 1994, he decided to leave his job as a credit controller and start his career as an artist. He followed his brother Cosmas Muchenje in taking up sculpting and soon developed considerable skills as a sculptor. Overtime, he worked on his own pieces and became proficient in representing the human form in stone-- a reflection of the skills of drawing human proportions he had learned at art school, while working on the most demanding stones (leopard rock, granite, serpentine and spring stone)- which enabled him to express the powerful imagination of his sculptures. He views his work as a sculptor quite differently from that envisaged by many other sculptors in his homeland. 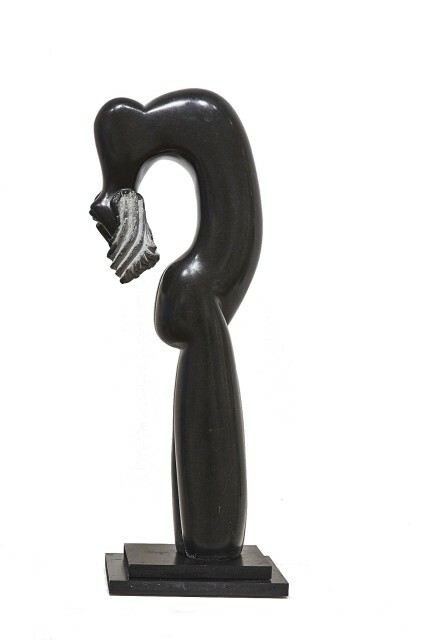 His ideas about sculpture embrace a wider universe rather than singularly what is produced in Zimbabwe in stone. Through his early travels to the UK where he worked as a sculptor showing his work in a London gallery, he developed an understanding of his craft and embraced some of the trends in British sculpting technics. Phillip feels that a powerful imagination is important to the success of a sculptor working in stone: ‘the ways in which the imagination can embellish the facts so that a story becomes more interesting and absorbing to the viewer”. Phillip Kotokwa has written a book about sculpture entitled ‘My Life in Stone Sculpture in Zimbabwe and Beyond’. It is one of the first books to be written by a stone sculptor from Zimbabwe. Phillip also teaches stone sculpting in workshops during some of his exhibitions. His works are displayed in various galleries in his home country including, the National Gallery of Zimbabwe, Chapungu Sculpture Park, Similitudes Gallery, Rubwerureva Attractions and African Millennium, and his works have been bought by many foreign collectors. Phillip Kotokwa works from his studio in Zimbabwe.